There is nothing quite like gathering around a nice warm fire in the comfort of your own home. However fire safety, especially indoors, should never be taken lightly. After all there are over 25,000 cases of chimney fires every year in the U.S. totaling over $100,000,000 a year in damages. Not to mention the unfortunate amount of lives lost in house fires started from improper care of fireplaces. When not regularly cleaned a dangerous substance known as creosote builds up in your fireplace. Creosote is highly flammable and comes from particles in smoke that stick to the inside lining of your chimney. When this build up exceeds 1/8″ or about once a year it’s time for a chimney cleaning, according to the National Fire Protection Association Standard 211. In addition to the extreme fire hazard this presents the build up of soot and creosote prevent the flue from drawing smoke properly. This forces smoke and a very dangerous gas known as carbon monoxide to vent out the front of your fire box filling your home. Why The Top Hatter is the clear choice for Phoenix chimney cleaning? It’s our namesake, The Top Hatter! No we wont be wearing a Top Hat and coat tails when we show up to clean your chimney. However, we will be professional, thorough, and friendly the way we’ve been doing it for 27 years. We have an A+ rating with the Better Business Bureau. Our knowledge and expertise is what really sets us apart from others. We take extra precautions to ensure that the inside of your home is as clean as it was when we got there. When we leave your fireplace will be perfectly cleaned and safe to burn in. What is the Best Time to Clean my Chimney? We get asked all the time why The Top Hatter? For over 25 years the Top Hatter Inc has been cleaning chimneys in the Valley. We re modern day experts in the trade. The Top Hat is not only our logo/name but a reminder of the rich heritage of those, usually less fortunate that came before us. Men and women have been practicing the chimney sweep trade for hundreds of years. The job was dirty, but necessary, and anything but glamorous! So in order to raise their status in the community, it is said that the sweeps would get discarded clothing from the local funeral directors. These clothes consisted of a black top hat, and a coat with tails, which was very fashionable for the times. They were also black which meant they were very practical. This gave the sweeps the status and self-esteem they wanted. Chimney sweeps have always been considered good luck, especially if you shake his hand, or be kissed by him. Not so lucky were the young boys and girls who were chimney sweeps in training in the 1700s and 1800s. 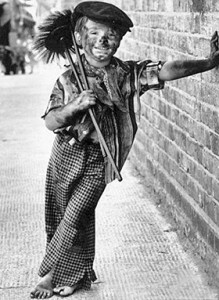 Many were orphans who were bought by a master chimney sweep to learn the trade. They were often neglected, abused and treated more like slaves than an apprentice chimney sweep. They were forced to climb up inside the chimney flue, sweeping the soot from the chimney walls as they climbed there way to the top. Many of the children became sick and died from constant inhalation of soot. Some chimney sweeps would use geese. They would tie a rope around the geese’s neck and force him up the chimney. As the goose started to fly up towards the chimney opening the sweep would pull the goose back down using his flapping wings to brush the soot from the flue. Later a combination of brushes, ropes, and rods were used. Today’s chimney sweeps are a combination of the old and the new. Chimneys are still swept with brushes, and rods to some extent. Powerful vacuums are know used to control the dust allowing the sweep to clean the chimney flue form inside the home, without any fear of a mess. The modern day chimney sweep is protected from soot by using a face respirator, and protective clothing, which keeps his exposure to soot to a minimum. Our job today as Chimney Sweeps, is just as important and necessary as it was centuries ago, and that job is to care for the safety of families and their homes. So select a chimney sweep, use him regularly, and when he’s done, don’t forget to shake his hand for Good luck! 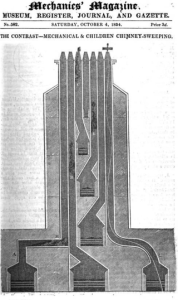 Cross-section of a seven flue stack in a four story house with cellars. A 1834 illustration designed to the show the contrast between mechanical sweeping and children sweeping chimneys. * A- is a hearth served by vertical flue, a horizontal flue, and then a vertical rise having two right-angled bends that were difficult for brushes. * B- is a long straight flue (14in by 9in) being climbed by a boy using back elbows and knees. * C- is a short flue from a second floor hearth. The climbing boy has reached the chimney pot, which has a diameter too small for him to exit that way. * E- shows a disaster. The climbing boy is stuck in the flue, his knees jammed against his chin. * H- A dead climbing boy, suffocated in a fall of soot that accumulated at the cant of the flue.